Kew: The Watercolour Flower Painter’s A to Z is an excellent illustrated directory of painting techniques by watercolourist Adelene Fletcher. This book documents techniques for painting 50 popular flowers from Agapanthus to Zantedeschia. 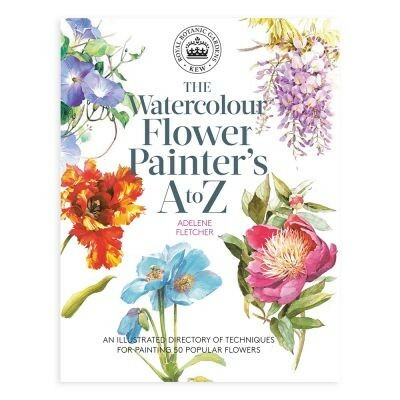 The brand new edition of ‘The Watercolour Flower Painter’s A to Z’ has been endorsed by the Royal Botanic Garden at Kew. This unique artists’ guide book features easy-to-follow, plant-specific instructions on how to paint some of the most popular flower species. Each instruction features guidance from established watercolour artist Adelene Fletcher that will help you through all the tough aspects of painting flowers. With Fletcher’s expert advice you will learn the essential skills in creating realistic floral structures and forms by observing closely the patterns of light and shade on petals and foliage. You will soon be painting flowers in a crisp, natural style! Each flower features its own step-by-step photographs and has detailed instructions on how to capture its individual properties. The book also advises on colour choices and mixes and highlights special details or techniques particular to each flower - this way you can have your palette planned and prepared before you start painting. A full colour copy of each finished watercolour flower is also included to demonstrate the breadth of depth and variety in plant portraits - from the exquisitely detailed passion flower to the bold colour of the oriental poppy. This is a great book for any watercolourist that has never painted flowers before, or those who are looking to capture the beauty of a specific species. Adelene Fletcher attended Manchester College of Art to train as a textile designer before she moved to London to pursue watercolour painting. Her work has been included in exhibitions at a variety of venues, including the Royal Institute of Painters in Watercolour and the Royal Watercolour Society annual exhibitions. She is also an established tutor in watercolour painting and has run art courses for adults for over twenty years. “Paint lovely studies of fifty popular flowers with this useful primer. Every book sold donates money to the Royal Botanical Gardens at Kew, funding their vital work. Aimed at anybody who has some basic skills but wants to extend their art repertoire to include flowers, there is a useful lesson in every project. As it says on the cover this is an illustrated directory of techniques and if you work your way through all the flowers you will amass a wealth of useful watercolor skills. Start by learning what colors you need to buy plus a brief overview of other materials, and progress though some short techniques which are particularly associated with painting flowers. Most of these are common to all watercolor work but the examples shown are all of plants so you can discover how to use them in context with floral depiction. A true beginner will probably require more in-depth instruction for basics such as wet-in-wet, dry brushing, masking out etc but anybody of at least improver level used to painting other subjects will find it useful. The rest of the book mostly consists of the fifty projects, taking you from agapanthus to zantedeschia. Each project covers two pages, one showing a picture of the finished work plus a few enlarged areas with notes and the other the method. Colors are listed with a blob of each which is helpful. These are all mentioned in the method, which is separated into a staged Sequence and at the bottom Special Detail which highlights a particular technique which you can learn or perfect with the project. At the back of the book is further help on composing floral groups plus a glossary and index. The glossary contains both watercolor and botanical terms, and each flower has a short piece describing it. Choose from a large range of garden and house favorites such as roses, sunflower, waterlily, poppies, tulip, nasturtium, passion flower, bird of paradise, poinsettia, carnation and many more. The rewards will not only include a wealth of lovely paintings and new skills but also the knowledge that buying this book has helped Kew Gardens important work including their Seed Bank. A good book for anybody who wants to learn how to paint flowers in watercolor."